It’s the middle Sunday of Wimbledon, which is designated as a day for rest, part of the tradition of the All England Lawn Tennis and Croquet Club (AELTC). Play thru the first week has gone by fairly smoothly with little disruption. There were quite a few rain delays but with the roof on Centre Court, we are on schedule for the second week. Roger has been looking very good thus far, winning all three matches in straight sets and doing so in utmost economical fashion. His serve can be thanked for this, as most of his service games finish so quickly it allows him to put pressure on his opponent in return games, and overall matches finish quicker. Less time spent on court means less energy spent, and more time to rest, recover, and prepare for the next round. He plays Mikhail Youzhny third up on Court 1 according to Monday’s schedule of play. Roger holds a 10-0 record against Youzhny, with their most recent meeting at Roland Garros (a while ago) in 2007. 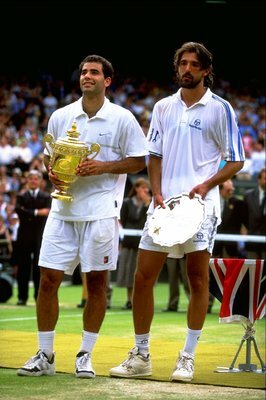 They have played three times on grass over the years, all at Halle, all routine except 2003 (Federer d. Youzhny 4-6 7-6 (4) 6-2). Interviews on Saturday questioned Roger and Rafa about the strength of their generation in light of a new wave of young players (Bernard Tomic, Milos Raonic, Ryan Harrison, Richard Berankis, Grigor Dimitrov). “It is difficult to compare the moments of tennis 15 years ago because the game changes,” Nadal said. “The only thing I can say is before, in my opinion, the top four players didn’t play as solid as today is going. I think all of the tournaments, even if there isn’t a Grand Slam … top players are always there in the finals, semifinals, playing in the final rounds. Probably in the past that didn’t happen a lot. “That’s probably because of two things. The courts are a little bit slower than before, so the best have a little more chance to play the points … if you have more time to play the best player have the better chances to win. Furthermore, Rafa had this to say about what he finds as enjoyable tennis. “I think it’s not fair to say that our generation is stronger,” Federer said. “For many years many people said it’s weaker just because there was only me and then there was only Rafa and me. And now, all of a sudden, there’s people talking about four. Now it’s the best ever. This is where I disagree. it doesn’t happen so quickly. My take: Rafa makes good points that the consistency of the top 4 today is very high, and you usually see all 4 of them making it farther in the masters tournaments which may not have always been the case perhaps ten to twenty years ago. This trend began with the unmatched consistency of Roger and soon after, Rafa as well. However, Rafa, the courts are a bit slower? Surely they are a lot slower, but because they are slower, the best have a little more chance to win if there is more time to play? No. The players who are suited toward slower surfaces win those, because they’re game is tailored to playing points out longer, not because they are better. Roger’s response goes straight toward giving respect for the previous generations and highlighting unique strengths of players which would be a factor in today’s generation of players. Regardless, will be interesting to see how these young players of the next generation of tennis will turn out. Visit WatchLive Monday morning to access live streams to watch all the matches. 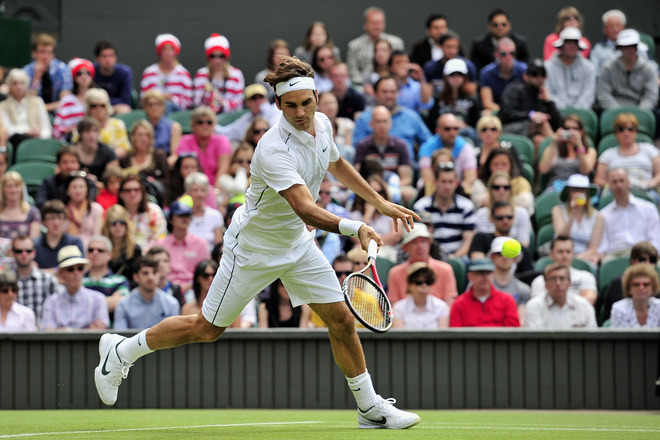 Check out the Wimbledon 2011 photo album at FedererFan ZeroSeven on Facebook. Follow @FedererFan07 on Twitter for instant updates.